So you found the home of your dreams, won the bidding war, finished the home inspection, and now it’s appraisal time. What does this mean? Your lender is asking you for money and you aren’t event sure what it’s for. Didn’t your agent already check the value? Well wonder no more. An appraisal in a real estate transaction is the bank’s way of confirming the worth of the property that they are going to loan money for – a third party, independent assessment of value. They order through a service so that they cannot influence the results and an appraiser will contact the seller or their agent to gain access to the home. They spend some time gathering information about the house, the neighborhood, and recent sales of similar properties. An appraiser will take pictures and measurements of your home before they return to their office to prepare the paperwork and crunch the numbers. Your appraisal will contain everything from tax value, cost per sq foot, market fluctuations, and upgrades. In the end, they will come up with a number that they feel is a fair representation of the property’s current value. As with anything, this number is somewhat subjective and can vary. Generally, this number comes in very close to the price you have agreed upon with the seller for the home. However, we have had the same home appraised by two different professionals with a difference in value of 11% – so anything is possible. When a property doesn’t “come in at value” most buyers and sellers get a little anxious. There are several things you can do in this situation, so all is not lost. 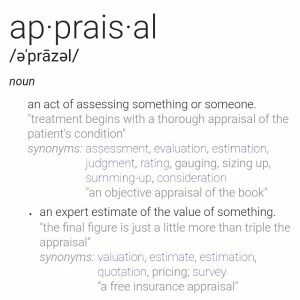 1 – Review the appraisal with your agent. Mistakes happen, so verify all of the information listed, both on the home those that were listed as comparable sales. If there are discrepancies, bring them up with your real estate agent and lender to ask what their process is to challenge the value. 2 – Consider having your agent negotiate with the seller. You can ask for the price to be reduced to the lender’s value, offer to remove a subsidy that might have inflated the price to allow the seller the same net cost on the home, or offer some sort of split with the seller to cover the difference. By this stage of the process, both buyer and seller have committed time and money to the sale and generally an agreement between the parties is found. 3 – If negotiations fail, the lender will allow a buyer to increase his down payment to close the gap. Discuss this at length with your agent, to make certain that you are comfortable with the price and able to make the investment required to complete the purchase. There are many reasons a buyer will pay more than appraised value, just as there are many reasons why a property might not appraise for the sales price – each transaction is unique and requires a full understanding of the situation. 4 – Should the above not work out, you can always walk away from the sale and have your deposit returned to you. In all things real estate related, the most important thing is that you understand all of your options and are able to make an educated decision comfortably. It is imperative that you have a team of professionals behind you with the knowledge and experience to help you navigate the waters of one of the biggest financial transactions of your life. If, at any time, you have questions please make certain to consult with your team (lender, real estate agent, settlement company) for a successful outcome.